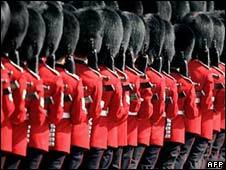 The Ministry of Defence has met an animal rights group to discuss alternatives to the bearskin hats worn by guards at Buckingham Palace. People for the Ethical Treatment of Animals (Peta) has approached Vivienne Westwood and Stella McCartney to design a new shape for the 18ins hat. The charity has previously called for fake fur to be used, but said the MoD was not happy with prototype designs. The MoD said it was "actively looking for alternatives" to using bearskin. Baroness Taylor, minister for defence procurement, met Peta on Tuesday. An MoD spokesman said it had arranged an industry day in October to explore the issue further. "We have invited Peta to attend that industry day and we wait to see whether they will take up our offer. "We are pleased that Peta acknowledges the progress MoD has made in producing faux fur alternatives for other ceremonial clothing, such as the busby cap worn by members of the Royal Horse Artillery and the leopard skins previously used by musicians. "In the meantime, we have to maintain existing stocks of ceremonial caps but we are minimising the need to take up new fur by refurbishing existing caps wherever possible." The MoD says it is open to alternatives to real bearskin, but that previous attempts to replace it with synthetic fur have failed because the material has not been durable or weatherproof enough. The ministry also wants to avoid if possible any change in the look of the red-coated sentries guarding Buckingham Palace, whose uniforms have long been one of the top tourist sights in London. However, Peta is proposing a new hat shape and has also approached designer Marc Bouwer as well as McCartney and Westwood. Robbie LeBlanc, Peta's director for Europe, said that although the group was proposing a different shape for the hats it did not mean the new design could not become "iconic". "Most people think it's fake fur and when they find out it's real and it takes one bear to make a hat, they are appalled," he said. The meeting is the culmination of a media campaign by Peta that has included a naked protest outside Buckingham Palace. More recently, comedian Ricky Gervais sent an open letter to Prime Minister Gordon Brown, calling the continued use of real fur inexcusable. "I understand and appreciate the importance of uniforms, but continuing to use real fur in the 21st century is inexcusable, regardless of 'tradition'," the letter said. "The public are relying on you to bring about a humane changing of the guards."